To be more specific – we’re committed to streamlining your website development and maintenance. With our experience in the retail, eCommerce, and digital industries, we understand the obstacles involved with in-store and online Business Management. Our background and dedication have helped us create the most efficient online and eCommerce solutions, whether it’s a stand-alone eCommerce website, full integration to multiple markets, or sharing information and tips. When our clients succeed, we succeed. That’s part of the reason why we offer custom packages – it’s our goal to help you reduce your monthly digital expenditures and increase your sale potential. Plus, we want you to get use out of all the features you’re paying for (something that’s often difficult to do with “Out-of-the-Box” solutions). If you were building a house from the ground up, you’d want to have some say in the planning, right? Your website shouldn’t be any different. We pride ourselves in giving our clients the blueprint, building personalized packages and services for each specific need. In short: We focus on your website, so you can focus on your business. Design & Development, Hosting & Support, SEO & Consulting, eCommerce & Market Integrations: We listen & work with our clients to make them successful online. Send product to your website directly from your POS system stress-free. Reduce data-prep efforts with our user-friendly integration software. Take the data your brands provide you to the next level: Seamless connection to your brands without the data entry. We’re the cloud inventory solution you’ve been looking for. Whether you’re set on your current platform or actively looking for new solutions and features, our consultations help us strategize together to determine the best solutions for you. Tired of missing new sales opportunities? Our eCommerce solutions for Integration help you become an omni-channel sales powerhouse and save you time: easily connect your POS inventory to top marketplaces and social media platforms without manual SO or product maintenance. Magento is our preferred eCommerce platform – it’s where we’ve built our most successful websites. Its powerful interface has been proven to grow merchant sales 3 times faster than the top 1000 eCommerce platforms in 2016 studies. Aside from sales growth potential, our favorite feature is the customizability. Magento rejects standard cookie cutter solutions by acknowledging that every business is unique. 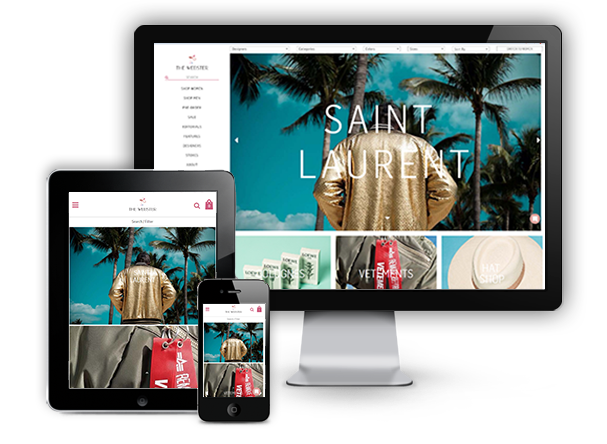 The platform provides users with full control over front and back-end website development, plus a massive catalog of extensions that optimize functionality and design user-friendly eCommerce websites. It’s also a highly scalable option that makes it easy to adjust your website hardware to grow with your online traffic and database (i.e. perfect for any size business, from small start-ups to established companies). If you’re interested in tailoring your website and brand to stand apart from the rest, send us a request for a free quote for Magento Website Design and Development.